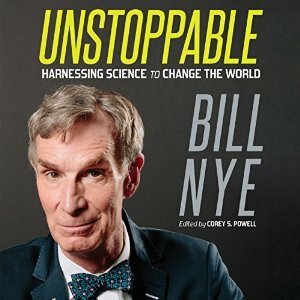 I grew up on Bill Nye’s science show on PBS. I appreciated his straightforward approach to teaching science to children that was both informative and humorous. Possibly in part due to this, I now find myself with a Master’s degree in Mechanical Engineering and employed in a very technical field. I also find myself writing books which are surreptitiously educational, hoping that the entertainment value of my writing will subtly inspire people to learn more about science. Consequently, merely based on the author of this book, I was interested in reading it, despite the somewhat vague and ambiguous title. While there was plenty of very interesting material presented in this book, much of it I had already known about by keeping up with the technological advances of the world today, I felt like its order was a little off. Right from the get-go, Nye hammers home that global climate change is a problem. The entire rest of the book then explores technologies and developments that could potentially solve, or at least abet the rapid rate of change leading to our soon-to-be unsustainable world. As a result, there’s a bit of fear introduced from the beginning that is tugged on throughout. I would have flipped these topics around and shown all the neat scientific breakthroughs (or near breakthroughs) we have in our current world, then use the knowledge of these advancements to address the climate change issue. In this way, I think the tone would be more inspiring and lead more people to pursue the solutions instead of being alarmist and driving people to act out of fear instead of out of the hope of what our future could be if we act now. Nye’s trademark humor is sprinkled throughout his writing, which made reading this book enjoyable. Furthermore, since he takes a very personal approach with his examples and stories (I love his “love/hate” relationship with Ed Begley Jr.), many of his opinions leak through. Many times throughout the book, these opinions came off to me as a bit off-putting, especially if the person reading this book happens to be of an opinion differing from Nye’s. As such, there was a bit of “preaching to the choir” that might not be helpful when trying to change the minds of those who don’t share the same opinions. Still, his attempts at re-framing the problem of global climate change and adjusting how we think about it were quite admirable and I think everyone should give his ideas a chance. A tale of both imminent danger and inspiration, I give Unstoppable 3.5 stars out of 5.